Le Mans 24 Hours winner Andy Wallace relived his 1988 victory by taking to the Silverstone circuit in his Jaguar XJR9-LM. Wallace also took new 550PS, 5.0-litre Supercharged V8 Jaguar XJR for a spin, during back-to-back day and night sessions. 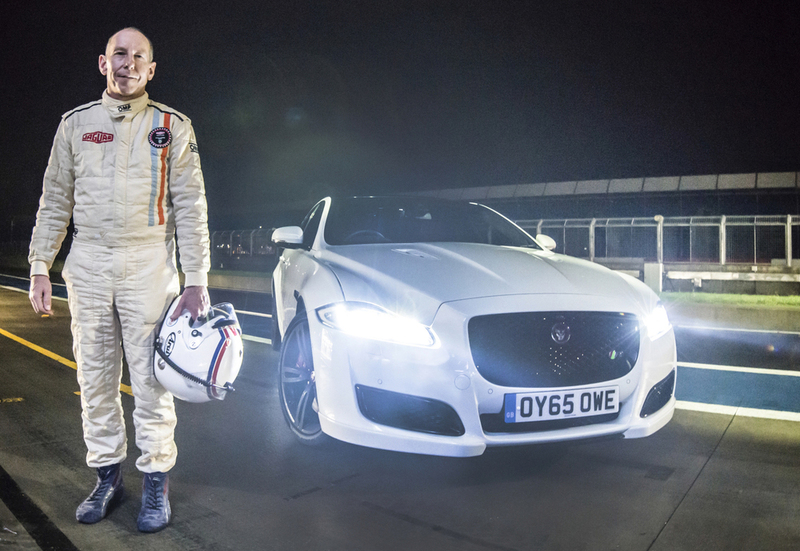 Driving at night on the Silverstone circuit gave Wallace the opportunity to test the new LED headlights on the new XJ, which are a first for Jaguar. "Driving at Le Mans back in 1988, it was so hard to see at night," said Wallace. "We were travelling at around 240mph and it was too fast to see the road ahead. We used the lights more to catch glimpses of landmarks as they whizzed past, so we knew where we were. "These days, modern road cars have incredible lights. LED technology allows you to see three times the distance we could back then, while active steer and bend also help target the lights to the places you want to see. The 2016 XJ has had, what Jaguar calls a 'thorough exterior design refresh' and the full LED headlights with unique double 'J-Blade signature' daytime running lights are one of the key additions, and are unique in the Jaguar range. Ian Hoban, Vehicle Line Director, XJ said: "The XJ is now more dynamic and distinctive than ever, and taking the high-performance XJR to Silverstone gave an excellent demonstration of how the new LED lighting fitted to the car can benefit the driver." The LED headlights provide a colour temperature closer to that of daylight than the Bi-Xenon lamps they replace, improving visibility and driver comfort and also delivering a significant improvement in energy efficiency. The most advanced lights ever seen on a Jaguar or Land Rover product, they also accentuate the 'quad lamp' design - a feature that also appeared on the XJR9-LM. The new Jaguar XJR SWB 5.0P S/C costs from £92,405 OTR.